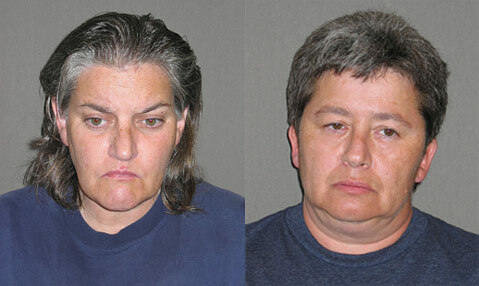 Karen Peterson (left), and Debra Mangino. The Santa Barbara Sheriff’s Department announced Friday that an ongoing investigation into credit card fraud has so far resulted in the arrests of two Buellton residents: 47-year-old Karen Peterson and 49-year-old Debra Mangino. According to a statement from Sheriff’s spokesperson Sgt. Alex Tipolt, a Buellton resident had told authorities in late July that someone had used his Social Security number in opening a credit card account. An investigation showed that the card had been used at a certain Buellton gas station and surveillance there allegedly caught Peterson and Mangino in the act of using the card. Tipolt noted that investigators have since found that the two women had been neighbors of the alleged victim. Sheriff’s deputies arrested Peterson and Mangino on Wednesday, August 6, on charges of unauthorized use of a credit card and commercial burglary. Their bail was revoked “due to a pending court case,” Tipolt noted.